Consistently hailed as one of Connecticut's leading chamber ensembles, the Lumina String Quartet has earned standing ovations and critical acclaim for its impassioned, dynamic performances. Since its inception in 1992, the group has maintained a residency at Norwalk Community College, presenting a subscription concert series as well as various educational and community outreach performances. In 1998 the quartet performed at the International Festival of Modern Art in Odessa, Ukraine. Since then, they have played at several international festivals in Europe. Eleven years ago, Lumina created the Chamber Music Institute for Young Musicians at the Rich Forum of Stamford Center for the Arts. This highly successful music festival started from one and grew to sixteen string quartets, with Lumina coaching young people in quartet performance. Lumina's repertory range is from the Baroque to the Contemporary with emphasis on New York City composers. Born in Russia, Ms. Meshberg, the founding member and the first violinist of the Lumina String Quartet, received her musical training at the Odessa Conservatory and at the Juilliard School of Music, where she earned a Master’s Degree, studying with Ms. DeLay. She has held the position of concertmaster of the Kansas City Philharmonic, the Seattle Symphony, and the New Jersey Symphony, and has performed and recorded for the seventeen years with the New York Philharmonic under the direction of Leonard Bernstein, Zubin Mehta, Kurt Masur, Sir Colin Davis and Erich Leinsdorf among others. Ms. Meshberg is the recipient of the 2003 Outstanding Women of Connecticut Award nominated by the United Nations. She is currently Artistic Director of the Chamber Music Institute for Young Musicians. Violinist Lynn Bechtold has appeared in recital throughout the U.S., and in Canada, Holland and Switzerland. An advocate of contemporary music, she has premiered works by Gloria Coates, John Heiss, and Alvin Lucier, among others has been a soloist with both the 2007 Philadelphia ElectroMusic Festival and Composers Concordance. An active chamber musician, she performs regularly with the East Village Opera Co., a 9-piece rock/opera band, & with the SEM Ensemble. Festival appearances include Kneisel Hall, Pacific Music Festival, Scotia, and both Spoletos, among others. Lynn holds degrees from the New England Conservatory of Music, Tufts University, and the Mannes College of Music, where she was a student of Felix Galimir. She is on the faculty of Greenwich House Music School in NYC. Born in Russia, Mr. Deviatov received his musical education at the Lviv Conservatory, Ukraine. He won top prizes as both violist and conductor, and toured extensively in Ukraine, Poland, Russia and Hungary. Joining the Leontovich String Quartet in 1990 changed Boris' musical life to a chamber music repertory, and in 1999 the Lumina String Quartet was happy to welcome him as a member. Ms. DeVore received her BA in Art History from Harvard University before earning her Master’s Degree from the New England Conservatory of Music where her teachers were Colin Carr and Laurence Lesser. She has toured Southeast Asia, Israel, Costa Rica, and Europe, and has appeared at Weill Hall, the Kennedy Center, Lincoln Center, and the Barbican Center in London. Ms. DeVore is a member of the Bridge Ensemble in New York City and the Harrisburg Players Collective. Particularly interested in contemporary music, she has premiered many new works, played in the Bang-On-A-Can Marathon and on WNYC’s "New Sounds", and has recorded pieces by Cage and Xenakis among others. Labeled as "an extraordinary performer" and "an artist of rare sensitivity", Phillip Bashor studied clarinet at the New England Conservatory on full scholarship with Harold Wright and chamber music with Rudolph Kolisch and Gunther Schuller. Mr. Bashor is principal clarinetist of the Greenwich Symphony and has been principal with numerous orchestras including Amor Artis, Kansas City Philharmonic, New Haven and New Jersey Symphonies and Brooklyn Philharmonic. At 19, he played principal clarinet for Leonard Bernstein's "Mass" for the opening of the Kennedy Center in Washington DC. Phillip has recorded sound tracks for numerous movies. Television credits include PBS Nature series, WWE and Cartoon Network. He has recorded for Philips, Columbia, Sony and BMG. 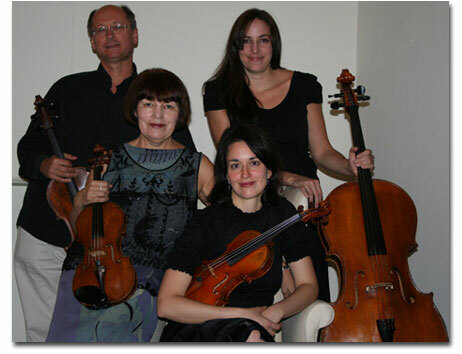 A member of the Greenwich Chamber Players, Phillip enjoys playing the vast repertoire of chamber music. With the Lumina String Quartet, he was invited to premiere several new compositions at International festivals, including Rashid Kalimullin's "Fantasy for Clarinet", which was recorded and broadcast over all of Russia.